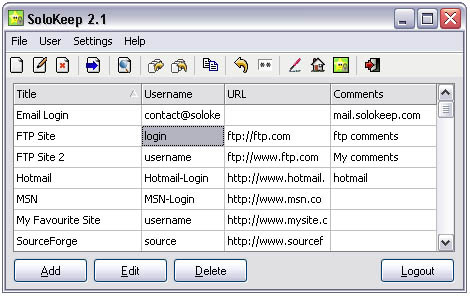 SoloKeep is a fast and easy to use application that stores all your passwords using encryption and password protection. SoloKeep can keep track of those hard to remember website passwords and other login information. Using a powerful encryption algorithm, SoloKeep ensures that no one else will be able to view your passwords without knowing your personal SoloKeep password. You'll never have to remember another username and password again.